AGM batteries like their cousins the Gel cell battery are also classed as Sealed Valve Regulated (SVR) batteries. 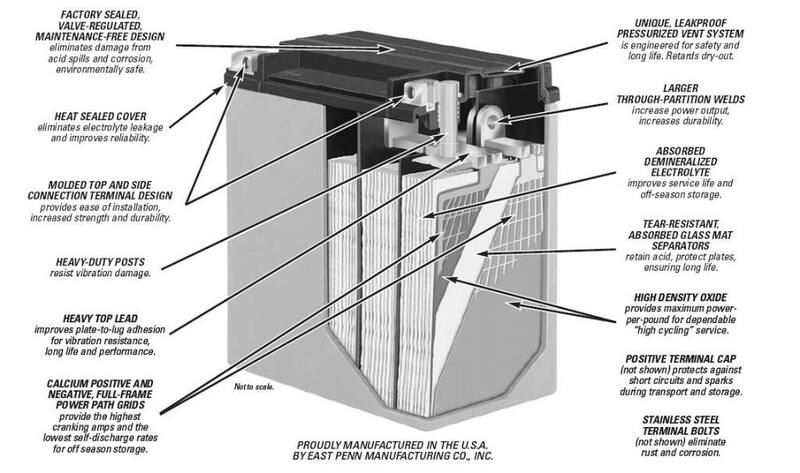 The battery electrolyte is held within a very fine microporous (boron-silicate) glass matting that is placed between the plates. This absorbs and immobilizes the acid while still allowing rapid plate and acid interaction. Another term used for AGM batteries is starved electrolyte batteries, and this is because the glass matting is only 95% soaked in electrolyte. In a normal lead-acid battery, water loss will occur when it is electrically broken down into oxygen and hydrogen near the end of charging. In a battery during charging, oxygen will evolve at the positive plate at approximately 75% of full charge level, and Hydrogen evolves at the negative plate at approximately 90% of full charge. In normal batteries, the evolved gases disperse to atmosphere, resulting in electrolyte loss and periodic water replacement, and these are the bubbles seen in the cells during charging. During battery charging the current causes decomposition of the water, and oxygen is evolved on the positive plate. The oxygen then migrates through the unfilled pores of the separator matting to react with the negative plate and form lead oxide, lead sulfate and water. The charge current reduces and does not generate hydrogen. The low maintenance recombinational battery has different characteristics. The plates and separators are held under pressure. During charging, the evolved oxygen is only able to move through the separator pores from positive to negative, reacting with the lead plate to recombine. The negative plate charge is then effectively maintained below 90% so inhibiting hydrogen generation. They emit less than 2% hydrogen gas during severe overcharge (4.1% is flammable level). The operational principle is called the recombinant gas absorbed electrolyte, as the generated gases recombine within the battery and significantly reduce hydrogen emissions. They emit less than 2% hydrogen gas during severe overcharge (4.1% is flammable level). This recombination process reduces water loss by over 98% in comparison to wet cell batteries, so the elimination of maintenance is obvious. The recombination process is different to a gel cell and takes place within the separator in a molecular state, with the cells being sealed and the relief valves provide a safe positive pressure during charging. There are variations to traditional flat plate manufacturing techniques, and the Optima® AGM batteries have a spiral cell, and dual plate construction. 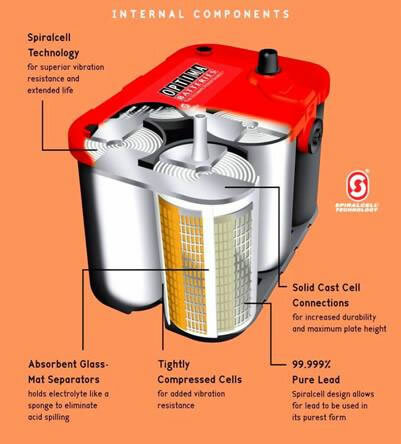 Another important claimed feature is a greater shock and vibration resistance than gel cell or flooded batteries. The batteries have a very low internal resistance and during heavy charge and discharge there are no heating effects. As they have a high charge acceptance rate they can be bulk charged at very high currents, typically by a factor of 5 over flooded cells, and a factor of 10 over gel batteries. They also allow 30% deeper discharges and recharge 20% faster than gel batteries and good recovery performance from full discharge conditions. If you are a weekend, harbour or river cruiser, that does limited motoring periods, or leave your boat unattended for fairly long periods, the AGM-battery is a viable proposition, as it has very low self-discharge rates, and very high recovery rates from deep discharges. As charge acceptance rates are very high and charging is in the range 14.4 to 14.6 volts then a fast charge regulator has the capacity burn out alternators. Many undersized alternators run at full output for considerable time periods and overheat. There is a good case for installing high output alternators to maximize charging, and the added load on the engine is a bonus. I have recently installed an AGM-battery bank so I will be watching the overall performance closely. Consider an AGM battery for your sailing or power boat.